I have to say, this has been a great year for interesting docs at SIFF, and the captivating and inspiring documentary Man on Wire (7/8) is no exception. 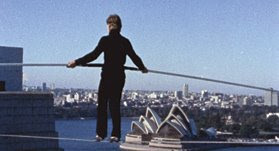 The film profiles confident, bold, and more than a bit crazy French acrobat Philippe Petit who strung a wire between New York City's barely-finished World Trade Center towers in 1974 and tightrope-walked between them (over 1350 feet, or 100+ stories above the street) as a sort of guerrilla artistic statement. The unbelievable story captivated the city and became front-page news across the world, in large part because of his group of friends (including French, Americans, and an Australian) who helped him secretly set up the stunt, and also carefully documented not only the event, but a huge amount of the preparation. The band of pranksters is interviewed in present time (they all now look to be in their 50s or 60s), and they recount their stories with bright-eyed enthusiasm like it was yesterday. It is a crazy, exciting story... one where the law was clearly broken, but no one got hurt, and the worst offense they could slap Petit with was criminal trespassing. It is a fabulous, inspiring documentary, and very uplifting. My follow-up film for the afternoon was the indie Half-Life (5/8) which was a noble, though a bit wobbly attempt at dysfunctional family drama combined with a dash of sci-fi. It takes place in a perhaps not-so-distant future where coastal cities are flooded, solar flares cause curious electrical disturbances, and the local news is rife with violent stories (which is actually not really that different from our present reality). Mom Saura Wu (Julia Nickson-Soul) is seeing a younger man who also has designs on her adult daughter Pam (Sanoe Lake), with Pam's little brother Tim (Alexander Agate) caught in the middle. There is also a side story with Pam's friend Scott coming out to his parents, which overlaps with the Wu family's own drama. The film suffers from uneven acting, mainly on the adult male side. The women are all strong and more interesting characters, but it is really the performance of young Alexander Agate as Tim that stands out. He absorbs the drama around him, and escapes via fantasies that appear as animation in the film. His performance is quite lovely. It is also a great-looking film, and may get distribution after the film festival circuit.